>It started the day before we left town last week… suddenly random channels on our cable (and hi-definition digital) television wouldn’t come in. Most of them, actually. But we had places to go and people to see, so we just left town, leaving our house/cat sitter a bit disabled… stuck in the guest room watching low-definition, non-digital TV for four days. Arriving back home Monday afternoon, I began the process by calling Comcast, our cable company. The representative I reached after making eight to twelve selections within selections, walked me through the process of re-booting. Sometimes that does it. Not this time. So… she tells me (yes, me) to unhook the box and take it to my local Comcast place, which closes in an hour. I’ve never been asked to do this before, I say. Before, when you guys were Time Warner Cable, someone with expertise always came out to the house to fix things. Oh, that won’t be necessary, she says, cheerfully. You can just take the box and swap it out. I think I was too dumbfounded to argue… or maybe just intimidated by how confident and perky she sounded. Anyway, finally it’s my turn, five minutes before closing, and the lady says, we’re out of replacement boxes, you’ll have to come back tomorrow after 2 p.m. Just as she says this, I’m thinking, you know, the TV in our bedroom isn’t getting these channels, either so she says let me send a signal and see what happens and she pushes some buttons on her computer. Then she says I should bring both boxes back tomorrow and replace them both. Both boxes. Now my husband and kids will tell you I am anything but technical, but this just did not make sense to me. Why would both of these boxes quit working at the same time? But, hey—she’s the expert, right? So I unplug the box in the bedroom next, again taking a picture so I’ll know how to plug them back later. Back at home hubby calls from out of town and I tell him the whole thing and he also says it’s odd and improbable that it’s the cable boxes, so the next day I call Comcast back again, and tell yet another expert the whole story. This time she says they need to send someone to the house. You think? But the first time they can come is Thursday… and the Country Music Academy’s awards are Wednesday night and I want to watch them on our flat-screen hi-definition set. Again, I’m remembering what the Greeks always say: What can you do? Thankful that I took pictures of the cables, I put both boxes back, replugging eleven cables into one and about seven into the other. Meanwhile, it’s 7 pm on Wednesday and the CMA Awards are on so I settle down to watch them in the guest room on the non-digital low-definition television. You must understand that for me this is like watching the Super Bowl. I’ve got a glass of wine in one hand and a stack of magazines and catalogues in the other and I’m all set. Just as it starts, I realize the sound is, like, crackly, or something… like a bad band-in-a-box thing that’s supposed to double the voice in harmony but instead it sounds like the people are nervous or something. Aaaaaarrrrrrgggggg! I run upstairs to see if the same thing is happening on our fourth television, a 9-inch non-everything set, and it’s the same there, so it must be a network problem. Yep. I check other channels and the only one having problems is ABC … where the Superbowl of Country Music is happening!!! After ten minutes a banner appears across the bottom of the screen: We are experiencing technical difficulties. An engineer is working to correct the problem. I think my love for country music is somehow connected to my love for creative nonfiction… it’s all such slice of life stuff, you know? Like the amazing stories in Haven Kimmel’s memoir, She Got Up Off the Couch, which have kept me laughing yesterday and today… somehow she tells true stories about a dysfunctional family without sounding, well, angry. 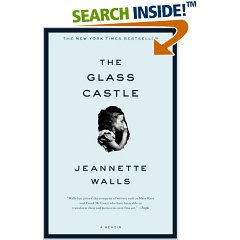 A friend and I had lunch today and she had just finished reading The Glass Castle and had the same response… how did Walls (the author, at left) write that gut-wrenchingly honest stuff about abuse, neglect and insanity with such humor and humility? Can I do that, or do I need to imbed the truths of those stories in fiction? BTW, hear a great interview with Walls here. And all day long today, I found myself tapping my toes and singing the lyrics from last night’s performances, especially “Our Song,”… while making a huge pot of homemade soup (for two families with new babies) and waiting for the Comcast Cable guy to come fix our cable. He got here at 4 pm. Walked out back and replaced a tiny little plug or something in the box on the outside of our house. Done in ten minutes. Only 21 hours late for the CMA Awards. But hey, it was a beautiful day… and the soup was yummy. And now, back to those essays….